Discussion in 'Guitars in General' started by steevo124, Sep 2, 2008. P.S. Can anyone tell from the picture if the fretboard looks like dark rosewood or ebony?? From the second picture, it looks like rosewood. Can't help you with the rest of your questions I'm afriad. If you can hear the diff b/w different species of rosewood you are CURSED. Hearing that sensitive would be terrible. I have a MB Mark Kendrick that I specified with Madagascar RW. I settled on it after much research and what I was looking for. I specified a maple neck with an alder body topped with a flame maple top. Pups are CS fat 50s. I wanted a fretboard that will balance the maple neck & maple top and not make it to treblely. When I talked to Mark he agreed with my decision and the result is a balanced very sweet sounding Strat. It is not a quacky Strat, but I find it tonally between a '65 Time Machine and a '54 MB Time Machine. If that makes sense to you. I do not have experience with a Strat with a BRW. But I have played and own Strats with Ebony FB and find them to be a bit trebbly, so I always have to adjust the amp EQ a little bit. When I say a bit, I mean it. It is not overwhelming but I hear it. For instance, I found the SRV sig a bit harsh to my ears so I changed the pups to CS '69 single coils and what a difference they made. That Strat is quacky but I find the range even and find some beel like tones with that combo. You are correct sir! African blackwood is in the same family. Having worked with Blackwood I can say it is very hard,as hard or more so than most Ebony. It rings like a bell when you tap it and is very abrasion resistant. If you assume it will be mellow because it is a rosewood you would be surprised with a brighter sound. Hey Steevo, how longs the wait gonna be for the masterbuilt? What will it look like? Specs? At least you have the new Guild, Charley, and Classic Reverb to keep you occupied. Thanks everyone for your input. This will better help me to make a decision.... It looks like a two year wait for a Cruz Masterbuilt. It's going to be a cross between The Muzic Zoo's Ultimate Relic and a JM signature. Basically it's going to have a standard 60's C shape maple neck, 6105 crowned jumbo frets (I play with my thumb on the low E a lot, so crowning them will save my thumb), African Black/Rosewood (not sure yet) fretboard, Cruz Select Alder body (Black relic), Gold Hardware,Pearloid tuners, aged plastics, no backplate with 5 spring tremolo and finally I'm going to ask Cruz to hand wind a custom set of Big dippers and make them a little weaker (lower output ) as well. That my friends, sounds like the perfect strat to me! 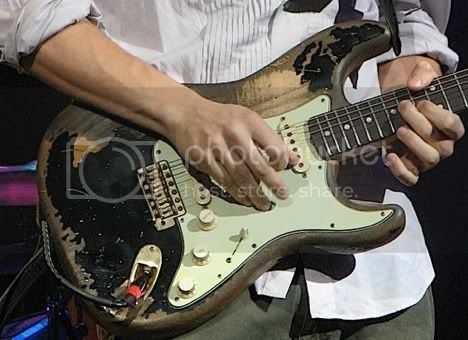 Can you ask Cruz more about the spec's on JM's relic, or at least what the pickups are closest to? I didn't know that John Cruz wound pickups, I believe that the orders get kicked over to Abby and her group. Also, keep in mind that the Big Dipper p/u's are pretty low output anyway. 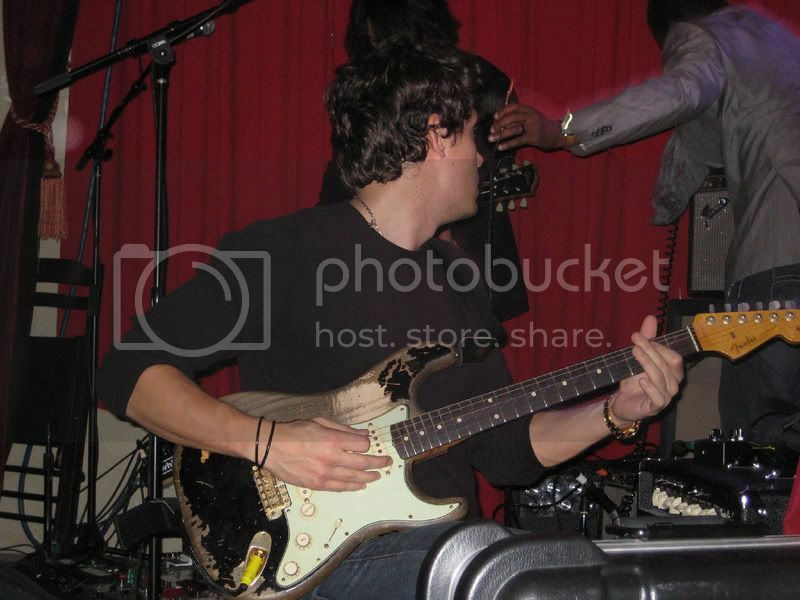 Last, that board on Mayer's strat is rosewood. I would be careful ordering wood that you're not familiar with on a guitar, you could find yourself with something other than what you were looking for. Steevo, it sounds like a really cool guitar. Can you post some pics when you get it? BTW, can you give a ballpark on what it's going to cost (no offense though if that info is private). Just specify Dark East Indian Rosewood and if it isn't dark enough....put some Fret Dr. on it. Some of the nicest boards I've ever seen have been dark EI Rosewood, I've even seen some that blew away some Brazillian boards. Should I go with East Indian Rosewood or African Rosewood thats on his signature model? I'd probably go with a nice dark E Indian board. It is a proven and known good wood that will deliver the tone and look you want. African rosewood can be a generic name, but is most used when referring to bubinga. Unless I had a pic and a true species name, I'd be cautious with anything labeled as just African rosewood. Just a suggestion, but you might want to try out some more guitars (buy used, play for free!) to figure out what specs you like before spending 6-7k on a guitar.